I know posting a “recipe” for a fast food place is probably out of the norm for a cooking blog, but I think it’s important to share resources & information about places to eat whole-food plant-based. So…that’s why I’m posting it! Eating out is very tough for me. One of the only places I can “mostly safely” go is Subway. There is technically a small amount of oil in the bread, but everything else about it looks like it follows wfpb-eating. I am hard-pressed to stay 100% true to wfpb when I eat out, so I have to cheat a tiny bit for this one. 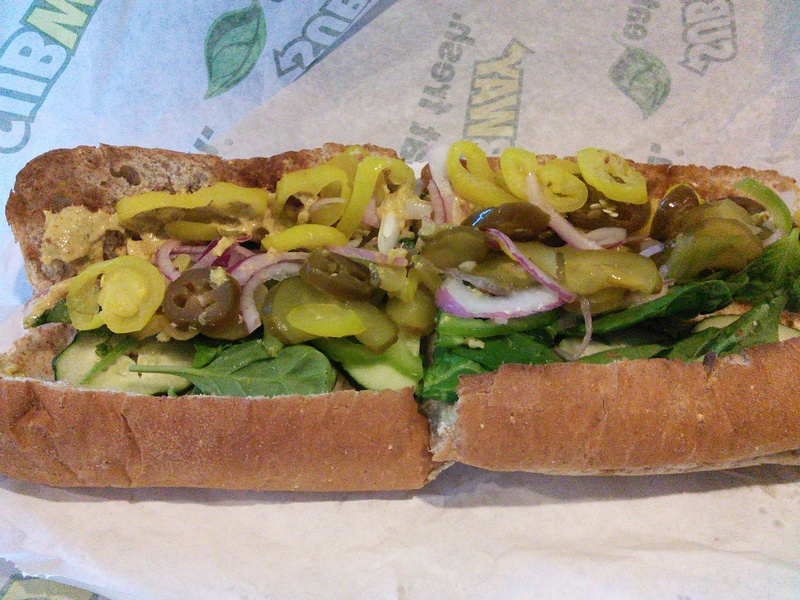 As far as restaurants/fast food goes, Subway is my go-to for a quick meal. If you’re following wfpb and looking for an easy take-out meal, I recommend trying Subway’s Veggie Delite sandwich and ordering whatever combination sounds good to you. Remember that the sauces are not safe for wfpb, with these two exceptions: the “spicy mustard” and “red wine vinegar” dressings. Following is a list of ingredients I order for a spicy sandwich combination.